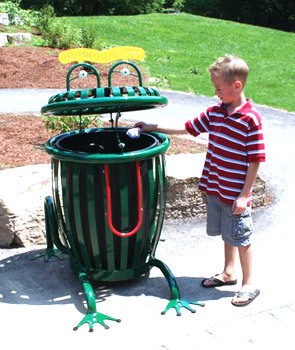 The ideal litter receptacle for zoos, parks, aquariums, and playgrounds, this friendly frog serves as an inviting and playful character that encourages children to properly dispose of their trash. The body is composed with durable ribbed steel slats that encase a removable black 34 gallon liner. Liner is easily accessible through the hinged lid that also acts as the frog's head. Receptacle is portable or can be surface mounted for permanent installment. Standard banner message reads "FEED ME! I LOVE LITTER". For a personalized message please select the Personalized option in the price chart under the Banner Message drop down menu. Once we have received your order, a customer service representative will contact you for message details. Please keep in mind that personalized messages may not exceed 22 characters.